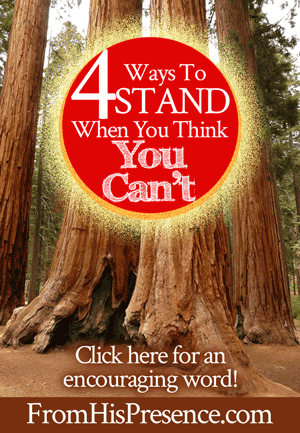 Are you trying to stand when you think you can’t? Do you feel like you’re about to fall at any moment? Are you going through something so hard that you feel like you can’t stand it any longer? If so, I wanted to share some encouragement with you today based on my own personal story. Awhile back, my husband and I were going through a bad financial storm. It lasted for years, and it was so bad that we watched our hopes and dreams fly out the window every month. I went into a deep, dark depression. I dealt with suicidal thoughts and a lot of demonic torment. It was awful. But during those times, there were several things that helped me a lot. I wanted to share those things with you today, in case they help you too. 1. Cling to the constancy of God. I was sitting in the back of my church orchestra, playing the djembe beside the drum set—out of sight and out of mind. It was a place where I could both play music and focus on God. And in the middle of a song, I finally got it. I had been sitting there feeling sorry for myself, depressed for such a long time over this financial situation. But suddenly, in the middle of the song, I had the sudden revelation: God is worthy to be praised whether I feel like it or not. I suddenly realized that He is still holy; still all-powerful; still good and kind and loving; still eternal; still omniscient; still my Savior … whether I was just delighted with everything going on in my life or not. I realized that I didn’t have a right to pick and choose when I praised Him, because whether I have a good day or bad day, HE is still the same. That revelation made all the difference in the world. I lifted my eyes up, ignored the drum at my feet, and lifted my hands in worship to God. Right then and there, I was convicted. And that revelation gave me an anchor in the waves. Before that time, my walk with the Lord really depended on how I felt from day to day. But after that time, my walk with the Lord depended on who God is. I began to be able to pray about my situation because of who God is, not just based on my level of warm fuzzy feelings on any given day. I began to praise Him each day because He deserves it, not because I was happy with what He was letting me go through. And I suddenly understood that God IS my Shield, my Protector, my Strong Tower, and so much more—whether I feel Him protecting me at any given moment or not. It really did make all the difference in the world. So if you are going through terrible times right now, cling to the constancy of God. Cling to the fact that He IS worthy of your praise, whether you feel like praising or not. Cling to the fact that He IS your ever-present Help in time of need, whether you feel like you are getting the help you want today or not. Cling to the fact that He is good, and He is faithful, and He will never leave you nor forsake you—no matter how you feel. If you will cling to Him, lifting your eyes off your problems and looking to His Sameness, you will be changed forever—and your hard time will suddenly become a lot easier to handle. 2. Shout God’s Word over yourself. Some people say that you don’t have to shout because God is not deaf … and that’s true. You don’t have to shout to make God hear you. He hears the smallest whisper, and the slightest thought of your heart. … I do encourage you to shout. Don’t shout just to rail at your circumstances, though. Instead, shout God’s Word over yourself until YOU hear that Word and come into agreement with it! So many times, I have done this. Anyway, I got that book and would pace back and forth in my kitchen, shouting God’s Word over myself. Those aren’t quotes from Joyce Meyer’s book per sé; they are just examples of the kind of things I shouted at myself. Sometimes I’d do this for an hour at a time. I did it for as long as it took to make darkness flee and my faith and courage rise up. But you know what? Those times of shouting, even when I didn’t feel like it, took root. The Word that I spoke over myself took root. After all, God’s Word does not return to Him void. It always accomplishes the thing for which He sent it! So after an hour of shouting out that I had faith, power, love, and a sound mind, I’d walk out of my kitchen WITH faith, power, love, and a sound mind. Yes, sometimes I had to do it all over again the next day. But that doesn’t matter. When you’re working out and losing weight, you may have a good workout one day—but you have to go back to the gym the next day. It’s the same with spiritual growth. When you’re learning to walk in victory, you win for today—and then you have to win again tomorrow for tomorrow. You work out your own salvation with fear and trembling. You learn to appropriate Christ’s victory one day at a time. So, if you’re going through a hard time right now: SHOUT! Shout God’s Word over yourself. Shout God’s Word over your situation. Shout God’s Word over your marriage; over your kids; over your finances. Nobody else can do this for you. Your spiritual victory is up to you. So SHOUT! 3. Pray, pray, pray, and pray some more—and watch for answers. Sometimes when you’re praying about a tough situation, God’s answer is “not yet.” And when that happens, it can be hard to wait until He says “Now it’s time for Me to move.” But you know how you can make the waiting time easier? Just couble down on your prayer efforts—about all sorts of things. When times are hard, don’t just pray about your hard situation. Pray about everything you can think of. When you do that, you give God more to work with because your prayers give Him permission to move in all areas of your life. This ministry; and so much more. And even though I didn’t see immediate answer to prayer regarding the financial situation, I saw TONS of answers to prayer in every other area. I saw my pastors and leaders being blessed. I saw friends healed and set free. I saw blessing after blessing in my job. You name it, God did it. Even though NOTHING moved regarding our financial situation! … He WILL say “yes” to other things. And when He does, His “yeses” to other things will both reassure you and build your faith that He is hearing your prayer about The Big Thing, and in time He will move to bring resolution. 4. Go ahead and ask God why—but be prepared for an unexpected answer. A lot of people will tell you not to ask God “why,” but I don’t believe that. I believe He’s always ready to talk to you about the “whys.” However, if we ask, we have to be prepared to listen to His answer—and His answer may not be what you expected. As soon as I asked Him “why,” He told me—and that answer was the most encouraging word I had received in years. And you shall remember that the Lord your God led you all the way these forty years in the wilderness, to humble you and test you, to know what was in your heart, whether you would keep His commandments or not. So He humbled you, allowed you to hunger, and fed you with manna which you did not know nor did your fathers know, that He might make you know that man shall not live by bread alone; but man lives by every word that proceeds from the mouth of the Lord. Your garments did not wear out on you, nor did your foot swell these forty years. You should know in your heart that as a man chastens his son, so the Lord your God chastens you. Therefore you shall keep the commandments of the Lord your God, to walk in His ways and to fear Him. For the Lord your God is bringing you into a good land, a land of brooks of water, of fountains and springs, that flow out of valleys and hills; a land of wheat and barley, of vines and fig trees and pomegranates, a land of olive oil and honey; a land in which you will eat bread without scarcity, in which you will lack nothing; a land whose stones are iron and out of whose hills you can dig copper. And you shall remember the Lord your God, for it is He who gives you power to get wealth, that He may establish His covenant which He swore to your fathers, as it is this day” (Deuteronomy 8:1-18). and, most importantly, to teach me that man does not live by bread alone, but by every word that proceeds from the mouth of God. It’s the biggest and most important lesson I’ve ever learned in my life. It totally turned my personal life around. That one lesson took me from being an up-and-down emotional roller coaster to being strong in the Lord and stable in the power of His might. made it SO MUCH EASIER to get through that period of absolute hell. And if you ask, Papa will tell YOU “why” too. I can’t guarantee that you will like what He says at first. But I CAN guarantee that He will give you HOPE along with His answer. His Word always brings hope! And if you know what He wants you to learn during this season, it’s far easier to get on board with His program and get through the test with a passing grade already! Beloved, no matter what you are going through, you CAN stand when you think you can’t. You might stand by collapsing on Father God and letting Him hold you up; as a matter of fact, I recommend that method. 🙂 You don’t have to stand under your own strength. But you CAN stand. Papa’s grace is sufficient for you, for His strength is made perfect in weakness. So whatever is going on in your life today, let Him be strong through you. Cling to His constancy. Speak His Word (yes, shout it even) out loud in faith. Pray without ceasing, and ask Him all the “whys” you need to know. He will answer. He will manifest Himself to you. And He will carry you through. Perfect message especially today. I too am facing bad financial situation — one keeping me from being able to pursue marriage and quite a few other things. And I am so ashamed not being married – what a disgrace & dishonor to Christ. Double down time … this is a temp situation & will clear up. Even though I feel ashamed, PS 34:1 comes to mind to bless the Lord at all times and keep His praise continually in my mouth. Thank you Jammie , this word is for me . Perfectly said. Thank you for you diligence . God richly bless you. Thank you for the God-given wisdom you have shared here. Your written word is very inspirational and settles deep within my spirit. I just came upon your site the other day and I am already being blessed. May God bless you and your family on this beautiful Christmas. Thank you for always listening to the Father and being obedient to speak a word in season to us who sometimes get weary in our trials. 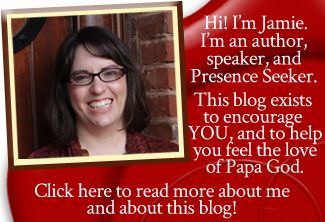 Your blog is a great encouragement to me. Thank You. I’m going through health issues. The treatments are really scary and toxic. I’ve been praying the Word over my body. Gods still on the throne. I love The Lord with all my heart, soul, mind and strength. Hi Jamie, I love your blog but the pages are taking incredibly long to download. Is there anyway to you cane make the pages lighter/ quicker to download? Thank you for opening my spiritual eyes. Hmmm. God bless u and all yours in Jesus name. The exact thing I need. I am going through a financial storm but the Lord has been faithful and I have felt guilty when I needed to ask God why?! Today, I found out He has listened to my silent whys’ and has answered and He gave me this charpter u quoted given to u verbatim. May His name be praised! Just now as I reflect on the day, knowing others share financial issues too & worse than mine, PRAISE be to Jesus Christ my big brother !!! Jude 25. He IS the only wise God and to Him goes all Glory, Majesty, Dominion, and Power, both now and forever. Thanks Jamie, I needed this as I’m going through hard times waiting on something big I’ve been praying for. It encourages me to keep praying! God bless you ?? Perfect message for me today really needed to hear that. Thank you for your blog knowing I am not alone. Going thru some hard times with Anxiety disorder/panic attacks and standing still waiting on my heavenly father. Thank you Jamie needed to hear this so much. The Lord bless you.